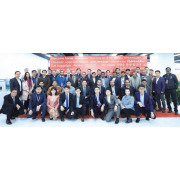 Our Technical Director, Mr Burt Grabe was at the INVT Global Partners Conference which was held in INVT Guangming Technology Building, on the 17th of December 2018. One of many highlights of this conference is the launch of new energy saving products. WEM Motors & Drives (Pty) Ltd are very excited for the launch of GD350 High-performance multi-function inverter, which will be launched in 2019. Multi-drive inverter GD600 will also be launched this year as well as DA300 Servo Drives and Motors. We look forward to working with you and saving your company money with our Energy Saving Products.